All animals come spayed/neutered, micro chipped, up-to-date on shots , de-wormed, dentals when needed, and any medical tests, blood work, or procedures needed to bring our rescues to a healthy state before going up for adoption. There is a $300 adoption fee requested for Heidi. Heidi is a 7 month old, female Pom. Heidi is very friendly and confident. She loves to meet new people and warms right up to them easily. She is a puppy and needs continuation in her training. She is good with kids, dogs, and ok with cats after a short introduction period. She loves to play and has the normal puppy energy. She would make a great addition to most families and would be a great companion to another dog with her same energy. There is a $300 adoption fee requested for Hannah. 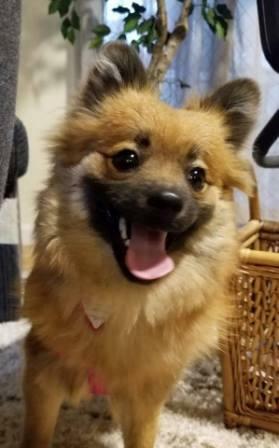 Hannah is a 7 month old, female Pom. Hannah is a very sweet little girl. She is a bit shy at first but after a few minutes she warms right up and is very friendly. She is a puppy and needs continuation in her training. She is good with kids, dogs, and ok with cats after a short introduction period. She loves to play and has the normal puppy energy. She would make a great addition to most families and would be a great companion to another dog with her same energy. Where do our dogs come from? We accept dogs from owner surrenders as well as pulling them from high kill shelters. 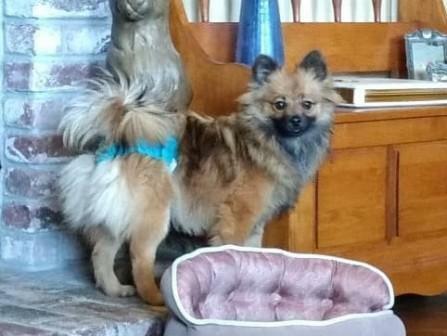 If you wish to discuss one of our Poms further, or need to surrender a Pomeranian, please click on the link below.